Is that a Lab in your Pocket ? ~ creators of PocketLab, introduce us to their app, which allows psychologists and quantifiable-self aficionados to catalog mindfulness. You can use PocketLab App to track your personal state of mind, to conduct complex data gathering on a study population or to monitor and enhance the mindfulness of patients, right from their smart phone ... Would you like to know more ? Sometimes when people get together, they may not realize the potential of what they are creating. I had a recent opportunity to meet an innovative pair who were working on creating what they believed would be an app only therapists may be interested in, but they recently found out their product may have more reach than they thought. 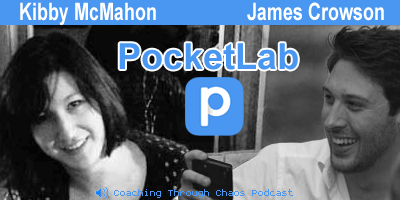 James Crowson and Kibby McMahon are the brains behind PocketLab. Kibby is a Ph.D. student studying psychology at Duke University and her partner James is the lead designer and developer. James has spent time working as a technology consultant in London before moving to Berlin to work at a start-up. He recently graduated with a Master’s Degree from NYU and has focused on building software since then. Prior to her attendance at Duke, Kibby spent time in NY and Berlin participating in cognitive research. Together their skills have been put to good use designing PocketLab, a web tool that lets you design and conduct your own mobile studies and surveys. PocketLab lets you conduct research on your clients (or on yourself – keep reading for explanation). The research is emotion or behavior based. You design the questions you want answered, your clients respond by completing the survey at what ever time or multiple times you set, and the data is collected by the app. It’s that simple. You design your study surveys in the web interface. You write your own questions, pick the types of responses you want to give your participants, select the participant groups, and design the implementation of the survey (daily, multiple times, every other day, etc.). The app collects your data for you. Whenever the topic of apps comes up around therapists the topic of data security and encryption is almost always the top concern. Well, James and Kibby have made this easy for you. They are using industry-standard encryption and data storage protocols. All private data is encrypted with 256-bit encryption and is transmitted using SSL technology. The data is stored in accredited, maximum-security data centers and you, the creator of the study, chooses how you identify your participants to protect their anonymity. Applications in research or private practice can be pretty creative. Of course, if you’re a practicing cognitive behavioral therapist, you may already be planning how you will survey your clients (“how do you feel when…. ?” “What do you do after you feel…..?”), but therapists working with highly sensitive people or people with certain personality disorders who may display high levels of emotional instability may get creative in designing surveys to help their client stay more aware of the emotions at different times of the day to notice specific emotional triggers. Yet another therapeutic use may be to help a client implement anxiety-management or self-soothing techniques depending on their answers. One may want to check in on their own emotional well-being. Someone may want to remind themselves to practice positive thoughts or collect data on how they feel throughout a day. Since you’re designing the survey you want yourself to answer, you really can be particular in how your word your questions and how you use the data you collect on yourself. For instance, someone may notice that they stay agitated for 90-minutes after they get out of their office at the end of the work day. After 3 weeks of this pattern emerging, they may decide to implement adding yoga or other exercise routine after work to help them with stress management. They would then track the new data collected after implementing the new behavior into their routine. Everyone gets a 10-Day Free Trial. James and Kibby have generously given the Coaching Through Chaos audience a special discount of 50% off their first month! Just enter DISCOUNT CODE 'CTC2015' when prompted. After your 10-Day Free Trial, that’s about 5 weeks of use for the price of 2! Pretty Sweet Deal! What’s in the works at PocketLab? When you try out PocketLab, give James and Kibby feedback so that as they develop the Pro version, they can also know what works well and how else you’d like to use PocketLab.